Seeing some of his jockey school classmates already having made an impact on the American racing scene, Jorge A. Vargas Jr. is doing what he can to make a mark of his own. Vargas, 23, leads Laurel Park’s current winter-spring meet standings with 35 wins and $1,158,229 in purse earnings from 160 starters. With 30 seconds and 29 thirds, his top three strike rate of 59 percent is also a meet best. And he leads in The Racing Biz alternative jockey ratings with 355.11 points out of a possible 400. On March 5 Vargas won four races at Laurel, one of nine multiple-win days he has enjoyed since making Maryland his primary home at the start of 2018. A native of Puerto Rico, Vargas attended the country’s famed Escuela Vocacional Hipica, a riding academy that has produced Hall of Famer John Velazquez and brothers Irad Ortiz Jr. and Jose Ortiz among others. Also in Vargas’ class were Victor Carrasco, the Maryland-based Eclipse Award-winning apprentice of 2013, and Jevian Toledo, the state’s overall leading rider in 2015 and 2017 and second in 2016. So, too, was Manny Franco, the leading rider in New York this winter. “It was a pretty good class,” Vargas said. Vargas was raised around the racetrack, the son and grandson of trainers. He first got on horses at age 11 or 12 and it wasn’t long before he knew he wanted to make riding horses his living. “My dad and my grandpa [Salvatore Vargas] were trainers in Puerto Rico, so it was always in the family,” Vargas said. “Going to the barns every day with my dad, he’d be doing something and when he wasn’t looking I’d jump on a horse. After winning a dozen races in Puerto Rico, Vargas made his way to the U.S. where his first mount was also his first winner, the Randy Allen-trained Caymus Girl, March 17, 2013 at Parx Racing. Other than brief stints in New York and California, the latter in the summer of 2014, he remained a mainstay at Parx and Penn National. Vargas had been considering a move to Maryland before the jockey colony was depleted by injuries to such top riders as Carrasco, Toledo, Trevor McCarthy and Horacio Karamanos. While Carrasco remains on the comeback trail from a broken leg suffered last fall at Delaware Park, Toledo returned March 9 and Karamanos followed a week later. McCarthy, Maryland’s two-time overall riding champion, returned in January but moved his tack to New York. Vargas contacted McCarthy’s former agent, Scott Silver, and the two have forged a successful partnership. Silver also represents Maryland’s Feargal Lynch. Vargas has enjoyed success riding for Kieron Magee, Maryland’s leading trainer from 2014 to 2016 who shared meet titles at Laurel winter-spring and the Preakness Meet at Pimlico in 2017. On Dec. 9 at Laurel, Vargas won three races, two of them for Magee including the Howard M. Bender Memorial Stakes aboard Struth. The same day he captured the Willa On the Move with Ms. Locust Point, whom he would later ride to victory in last month’s Barbara Fritchie (G2). Vargas’ other graded-stakes win came in the 2017 American St. Leger (G3) at Arlington Park aboard Postulation. With the winter-spring meet running through May 6, Vargas hasn’t given much thought to the riding title. 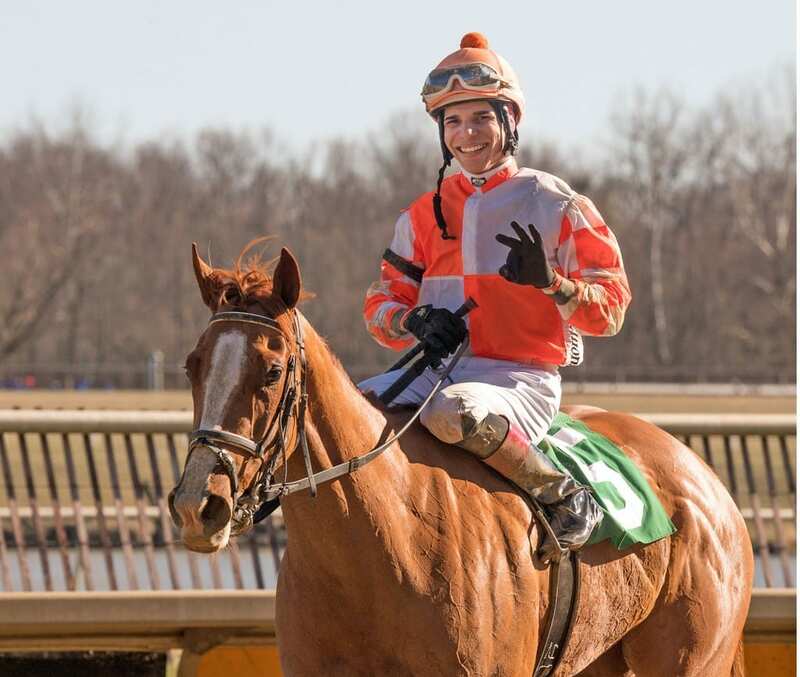 Apprentice Wes Hamilton, youngest son of Maryland’s Steve ‘Cowboy’ Hamilton, has won five of his last 10 starts including a four-win day March 17 to climb into second place in the standings with 26 wins.